Tourism New Zealand is responsible for marketing New Zealand to the world as a visitor destination. Its iconic marketing campaign, 100% Pure New Zealand, tells the story of how our country provides an unforgettable experience that cannot be found elsewhere, thanks to its unique blend of landscapes, people and activities. 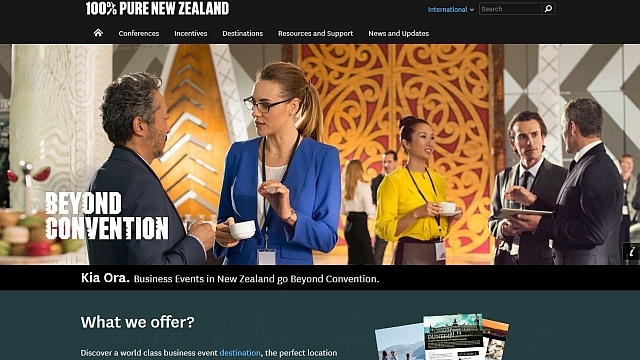 Tourism New Zealand was looking for support to develop a new Beyond Convention Business Events and Conferences website for business events planners and companies looking to offer incentive travel to their staff. The website required content that would capture people’s imaginations and inspire them to hold their events in New Zealand. From the website’s inception, Last Word worked with Tourism New Zealand and its digital design agency to refine the site’s navigation and layout. Last Word then crafted the written content for all sections of the site, ranging from engaging teaser content on the site’s homepage and informative overviews of major New Zealand destinations to activity guides featuring themed incentive experiences for businesses looking to reward or motivate staff. The site is now the go-to portal for people who are considering running conferences or pre- and post-event tours in New Zealand. It also widely used by the travel trade when organizing familiarisation trips to New Zealand for their staff to enable them to more effectively sell travel to New Zealand in their home markets. We were asked to deliver "magical" website content for Tourism New Zealand's business events website. The site is visited over a hundred thousand times a year. Web content helped promote New Zealand locations to overseas companies considering running business events or incentive experiences in New Zealand. Themed itineraries were developed to showcase different experiences business and incentive travellers could enjoy when visiting New Zealand. Venue information was written to showcase some of the brilliant and memorable conference venues in New Zealand that go beyond convention.